European Plastics Converters (EuPC), in cooperation with Plastics Recyclers Europe (ww.plasticsrecyclers.eu), Europur (www.europur.org), Vinyl Films and Sheets Europe (www.vfse.org), Waste Free Oceans (www.wastefreeoceans.org) and Petcore Europe (www.petcore-europe.org), presents the first edition of its Circular Polymers in Furniture conference on the 26th November 2018 in Brussels. 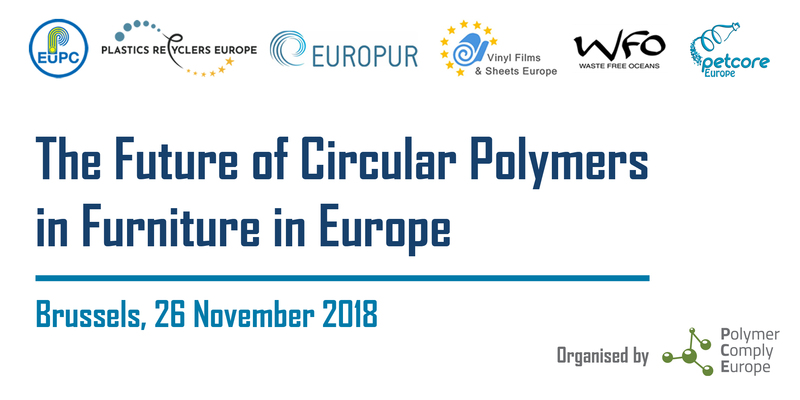 Save the date to learn more about the future of polymers in furniture in the circular economy. Join the discussion and get exclusive insights on the industry's way towards a more sustainable future. Representatives from the entire plastics value chain will share their vision for the transition to a more circular economy.